On Sept 14, the Closing Ceremony of COSPAR Capacity Building Workshop was held at NSSC. The workshop of a duration of 12 days focuses on Remote Sensing of the Global Water Circulation to Climate Change. More than 110 lecturers, students from the workshop and officials from organizing sides such as COSPAR, NSSC, APSCO as well as young scientists and students from NSSC attended the ceremony. Professor Giovanni Bignami, COSPAR President, Professor WU Ji, Vice-President of COSPAR and Director General of NSSC, and Mr. Tsoodol, Director General of Department of Education Training and Database of APSCO gave short speeches at the Closing Ceremony. The Closing Ceremony was hosted by Professor Ernesto Lopez-Baeza, Co-chair of the workshop. As the student representative, Abeer Mazhar extended her appreciation to the workshop and to all the lecturers and the Local Organizing Committee during her short speech. In the end, 33 students from 14 countries around the world received the diplomas delivered by COSPAR President Professor Bignami, who gave a high prize to both the workshop content and organizing. 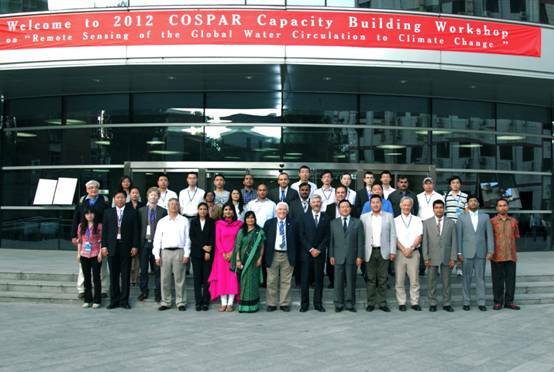 COSPAR Capacity Building Workshop on Remote Sensing of the Global Water Circulation to Climate Change is one of the successful workshops held by COSPAR in the past years. This successfully held workshop in NSSC can also provided the treasure chances for the Chinese young scientists to improve academic level and widen the scientific view on their research.